Bottom is a new demo for the Commodore C64 from the group Bonzai. The demo is based on the TV-series Bottom with Rik Mayall and Adrian Edmondson. 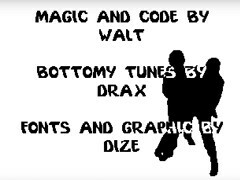 The demo is made by Walt (code), Drax (music), Dize (graphics) and Trap (text).